Our visit to this planet is short, so we should use our time meaningfully, which we can do by helping others wherever possible. For our life to be of value, I think we must develop basic good human qualities — warmth, kindness, compassion. Then our life becomes meaningful and more peaceful — happier. If we are to create a more peaceful world, made up of peaceful individuals, we need a greater concern for others — altruism. That gives inner strength, self-confidence. The remedy is to look deeper and recognize that we human beings are physically, mentally and emotionally the same. As individuals we can influence our own families. Our families can influence our communities and our communities can influence our nations. An eye for an eye… we are all blind. On what surprised him most about humanity: Man. Because he sacrifices his health in order to make money. Then he sacrifices money to recuperate his health. And then he is so anxious about the future that he does not enjoy the present; the result being that he does not live in the present or the future; he lives as if he is never going to die, and then dies having never really lived. We have bigger houses but smaller families; more conveniences, but less time; We have more degrees, but less sense; more knowledge, but less judgment; more experts, but more problems; more medicines, but less healthiness; We’ve been all the way to the moon and back, but have trouble crossing the street to meet the new neighbor. We’ve built more computers to hold more information to produce more copies than ever, but have less communications; We have become long on quantity, but short on quality. These times are times of fast foods; but slow digestion; Tall man but short character; Steep profits but shallow relationships. It is time when there is much in the window, but nothing in the room. 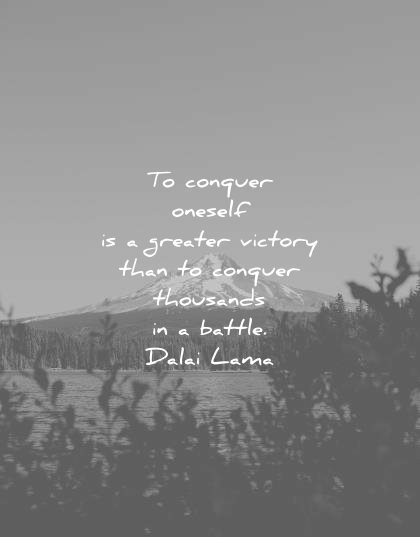 One liners, short Dalai Lama quotes, thoughts and captions for your bio, social status, self-talk, motto, mantra, signs, posters, wallpapers, backgrounds, tattoos, SMS, Facebook, WhatsApp, Snapchat, Tumblr, Twitter, Pinterest, Instagram, etc. Optimism leads to success; pessimism leads to defeat. Action is more important than meditation. Proper utilization of time is so important. While we have this body, and especially this amazing human brain, I think every minute is something precious. There are two kinds of compassion. The first comes from a natural concern for friends and family who are close to us. This has limited range but can be the seed for something bigger. We can also learn to extend a genuine concern for others’ well-being, whoever they are. That is real compassion, and only human beings are capable of developing it. When life becomes too complicated and we feel overwhelmed, it’s often useful just to stand back and remind ourselves of our overall purpose, our overall goal. When faced with a feeling of stagnation and confusion, it may be helpful to take an hour, an afternoon, or even several days to simply reflect on what it is that will truly bring us happiness, and then reset our priorities on the basis of that. This can put our life back in proper context, allow a fresh perspective, and enable us to see which direction to take. The quality of what we do depends on our motivation, which is why we have to learn how to cultivate a compassionate mind. Optimism doesn’t mean that you are blind to the reality of the situation. It means that you remain motivated to seek a solution to whatever problems arise. 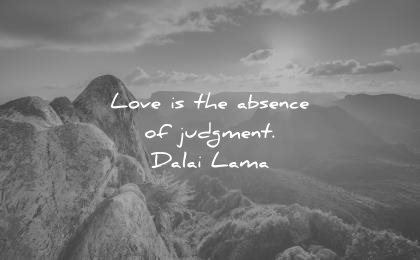 As long as we observe love for others and respect for their rights and dignity in our daily lives, then whether we are learned or unlearned, whether we believe in the Buddha or God, follow some religion or none at all, as long as we have compassion for others and conduct ourselves with restraint out of a sense of responsibility, there is no doubt we will be happy. We all have the power of thought – so what are you lacking? If you have willpower, then you can change anything. Most people prefer a smile to a frown. It’s human nature. Even dogs respond with wagging tails to a smile and other shows of affection. Instead of looking to blame others and the world around us, we should first look within ourselves. The challenge today is to convince people of the value of truth, honesty, compassion and a concern for others. There is a saying in Tibetan, ‘Tragedy should be utilized as a source of strength’. No matter what sort of difficulties, how painful experience is, if we lose our hope, that’s our real disaster. Because motivation pervades all action, it is important that we have a positive motivation. Whatever we are involved in, whether it’s politics, education, medicine, law, engineering, science, business or industry, the nature of our motivation determines the character of our work. We are the controller of the technology. If we become a slave of technology, then that’s not good. Ethics are not a collection of commandments and prohibitions to abide by, but a natural inner offering that can bring happiness and satisfaction to ourselves and others. 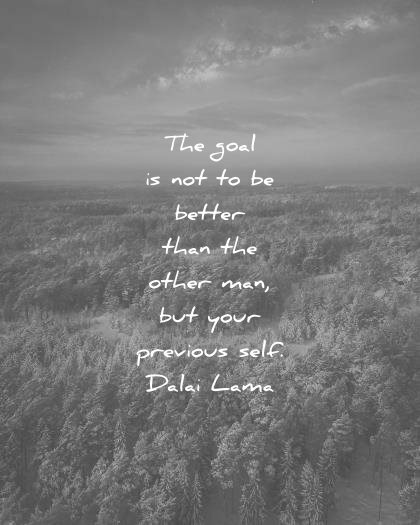 I don’t dwell on being the Dalai Lama, I think of myself as just another human being. And when I meet someone else I greet them as a brother or sister, which brings me joy. Self-centredness, being obsessed with ourselves, just brings us trouble. When you don’t have much concern for others and you feel you’re the center of the universe, you’ll be dogged by feelings of suspicion left and right. We are deluded by attachment and anger, but we can learn to tackle these emotions. Thinking of ourselves as somehow special isolates us. Foolish, selfish people are always thinking of themselves and the result is always negative. Wise persons think of others, helping them as much as they can, and the result is happiness. Just as we can learn how helpful love and compassion can be, we can come to understand that anger, pride, jealousy and arrogance can be detrimental. Instead of trying to resolve our differences by force, we must talk and enter into dialogue. This is not a sign of weakness, but of wisdom — a realistic approach. 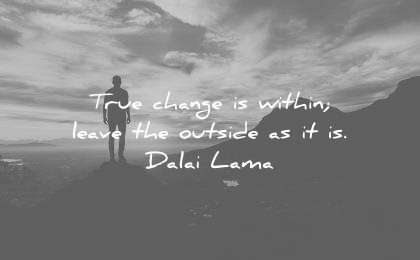 Whether our action is wholesome or unwholesome depends on whether that action or deed arises from a disciplined or undisciplined state of mind. It is felt that a disciplined mind leads to happiness and an undisciplined mind leads to suffering, and in fact it is said that bringing about discipline within one’s mind is the essence of the Buddha’s teaching. Part 1. If we think only of ourselves, forget about other people, then our minds occupy very small area. Inside that small area, even tiny problem appears very big. Part 2. The moment you develop a sense of concern for others, you realize that, just like ourselves, they also want happiness; they also want satisfaction. Part 3. When you have this sense of concern, your mind automatically widens. At this point, your own problems, even big problems, will not be so significant. The result? Big increase in peace of mind. Part 4. So, if you think only of yourself, only your own happiness, the result is actually less happiness. You get more anxiety, more fear. Be ready to change your goals, but never your values. Compassion is the wish for another being to be free from suffering; love is wanting them to have happiness. There are ways in which we can consciously work to develop feelings of love and kindness. For some of us, the most effective way to do so is through religious practice. For others it may be non-religious practices. What is important is that we each make a sincere effort to take our responsibility for each other and for the natural environment we live in seriously. When we talk about compassion it has to include having compassion for yourself. It’s not just a matter of self-sacrifice. I have observed a foolish sense of selfishness and a wise sense of selfishness. Since we are social animals, who depend on one another, to show love and compassion to others is wise. If at the beginning and end of our lives we depend upon the kindness of others, why in the middle of our lives should we not act kindly toward them? It is the pragmatic choice. A heart full of love and compassion is the main source of inner strength, willpower, happiness, and mental tranquility. Cultivating a close, warmhearted feeling for others automatically puts the mind at ease. It helps remove whatever fears or insecurities we may have and gives us the strength to cope with any obstacles we encounter. It is the principal source of success in life. If love is defined as a wish that others be happy and compassion as the wish that they be free from suffering, and you cultivate love and compassion within yourself, it will ensure happiness, good health and peace of mind. If there is love, there is hope that one may have real families, real brotherhood, real equanimity, real peace. Consider carefully, what prevents you from living the way you want to live your life? A person’s underlying outlook and motivation can certainly affect how he or she responds to life’s adversities and dangers. An attitude of kindness and compassion brings a sense of self-confidence, an inner strength that reduces fear. In fact, an individual’s response to danger and ability to deal with fear can often depend more on their outlook and personal characteristics than on the nature of the situation itself. You may go to bed at night confronted by many problems in your life, but it’s hope that motivates you to get out of bed and carry on with your life next morning. Let us reflect what is truly of value in life, what gives meaning to our lives, and set our priorities on the basis of that. “Happiness” means mainly a sense of deep satisfaction. The object of life or our goal, then, is satisfaction. One great question underlies our experience, whether we think about it or not: what is the purpose of life?… From the moment of birth every human being wants happiness and does not want suffering. Neither social conditioning nor education nor ideology affects this. From the very core of our being, we simply desire contentment… Therefore, it is important to discover what will bring about the greatest degree of happiness. When you are discontent, you always want more, more, more. Your desire can never be satisfied. But when you practice contentment, you can say to yourself, ‘Oh yes – I already have everything that I really need’. We seek happiness in external things without realizing that they don’t help when we have problems within. We need to focus instead on the joy that comes with peace of mind that allows us to remain happy whatever happens. A good motivation and honesty bring self-confidence, which attracts the trust and respect of others. Therefore the real source of blessings is in our own mind. We need to ask ourselves how to find happiness — it’s not in money and power. Many of the problems we face today are our own creation. 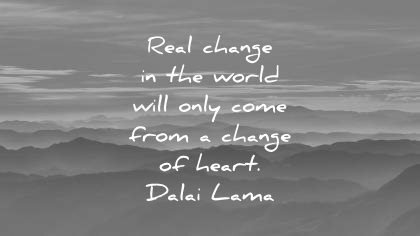 Creating a more peaceful world requires a peaceful mind and a peaceful heart. As human brothers and sisters we must live together in tolerance and affection. The creation of a more peaceful and happier society has to begin from the level of the individual, and from there it can expand to one’s family, to one’s neighborhood, to one’s community and so on. When you care for others, you manifest an inner strength despite any difficulties you face. Your own problems will seem less significant and bothersome to you. Reaching beyond your own problems and taking care of others, you gain confidence, courage and a greater sense of calm. A source of trouble is our unruly minds. We can counter that by developing a warm heart. We need to effect an inner transformation, to understand that love and affection are a real source of joy. When our community is in a state of peace, it can share that peace with neighboring communities, and so on. Anger and fear undermine our immune system, while warmheartedness brings peace of mind. Therefore, just as we teach children to comply with physical hygiene for the good of their health, we should also counsel them in a kind of hygiene of the emotions. Anger itself makes us feel bad and so, ultimately, it is bad for our health. Scientists have shown that where constant anger and hatred undermine our immune systems, compassion strengthens our general well-being. To live more peacefully and joyfully in our day to day lives, we need a warm heart. Better grounded emotionally through patience, we become stronger mentally and spiritually, and tend to be healthier physically. Violence derives from anger and anger clouds our ability to think straight and properly assess what is happening. Just as we employ physical hygiene to protect our health, we need emotional hygiene, the means to tackle our destructive emotions, if we are to achieve peace of mind. Anger and aggression sometimes seem to be protective because they bring energy to bear on a particular situation, but what needs to be acknowledged is that that energy is blind. It takes a calm mind to be able to consider things from different angles and points of view. Problems will always arise, but we need to address them differently. We need to engage in dialogue to resolve them rather than resorting to the use of force. We are intelligent, we have seed of compassion from birth. Using reason and intelligence we can enhance our sense of compassion and come to understand how its opposite, anger, is harmful. In a world where people easily fall under the sway of anger and hatred, we need love, tolerance and contentment. 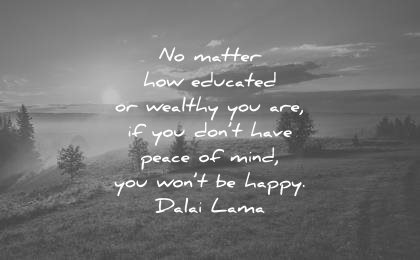 You may have all the physical amenities you need to be comfortable, but it you have no peace of mind, they won’t make you happy. On the other hand, if you have peace of mind, you’ll be happy whether you have those amenities or not. Letting yourself be overtaken by negative emotions leads to suffering. Therefore, it’s important to recognize the shortcomings of an unruly, undisciplined mind. If you train your mind, you’ll suffer less. We need to discover not only what disturbs our minds, but also what the antidotes to those factors are. Anger destroys our peace of mind; loving-kindness earns us friends and eliminates the risk of being alone. When reason ends, then anger begins. 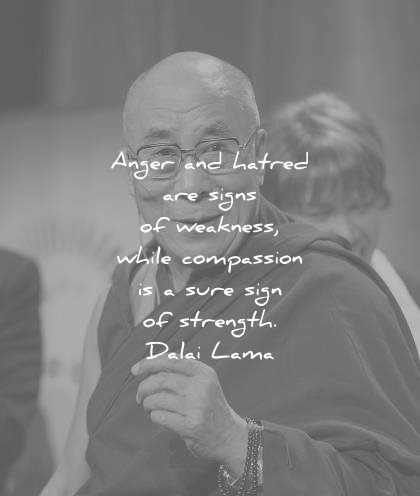 Therefore, anger is a sign of weakness. Human beings are social animals and that it is love that brings us together, while anger drives us apart. The more time you spend thinking about yourself, the more suffering you will experience. When someone who has lived a kind life dies, people miss them and say so. But when an angry, greedy, ruthless person dies, there’s a sense of relief. So, I try to practise warmheartedness wherever I go. In our concern for others, we worry less about ourselves. When we worry less about ourselves an experience of our own suffering is less intense. One begins by identifying those factors which lead to happiness and those factors which lead to suffering. Having done this, one then sets about gradually eliminating those factors which lead to suffering and cultivating those which lead to happiness. That is the way. It is important not to allow ourselves to be put off by the magnitude of others’ suffering. The misery of millions is not a cause for pity. Rather it is a cause for compassion. We human beings are all the same in wanting to be happy and not wanting to suffer and yet many of the problems we face are of our own making. It’s good to remember that other human beings are like us. We are born the same way; we die the same way. While we’re alive it’s better to be able to trust each other as friends. When we develop patience, we find that we develop a reserve of calm and tranquility. We tend to be less antagonistic and more pleasant to associate with. This creates a positive atmosphere around us and it is easy for others to relate to us. We need friends and friendship is based on trust. To earn trust, money and power aren’t enough; you have to show some concern for others. You can’t buy trust in the supermarket. If we are sincere in taking care of others, if we protect their lives and respect their rights, we’ll be able to conduct our lives transparently and that is the basis of trust, which in turn is the basis of friendship. I accept everyone as a friend. In truth, we already know one another, profoundly, as human beings who share the same basic goals: We all seek happiness and do not want suffering. Friendship depends on trust, not money, not power, not mere education or knowledge. Only if there is trust will there be friendship. If the child is not held, hugged, cuddled, or loved, its development will be impaired and its brain will not mature properly. My main hope is eventually, in modern education field, introduce education about warmheartedness, not based on religion, but based on common experience and a common sort of sense, and then scientific finding. It’s only after they have spent time in the modern education system that children begin to develop a sense of ‘us’ and ‘them’ — a stifling of their basic human nature. We need to learn how to keep our natural compassion alive and how to extend and develop it so it can encompass the whole of humanity. Modern life and modern education are focused on external goals — peace of mind concerns the mind within. There’s a need to improve our education systems. We’re used to instructions about observing physical hygiene to preserve our health, but we need to add to it a sense of emotional hygiene. This means learning to tackle destructive emotions like anger, fear and hatred. Ultimately we have to change attitudes, not by law but by education. We can’t say that all religions are the same, different religions have different views and fundamental differences. But it does not matter, as all religions are meant to help in bringing about a better world with better and happier human beings. On this level, I think that through different philosophical explanations and approaches, all religions have the same goal and the same potential. Whether you believe in God or not does not matter so much, whether you believe in Buddha or not does not matter so much. You must lead a good life. The first of my personal commitments is to work to increase human happiness by encouraging the cultivation of inner values and a sense of concern for others’ well being. These are the key factors whether one is a religious person or not. Young children don’t care about nationality, faith or caste. Because these ideas prompt us to think in terms of ‘us’ and ‘them’, they are divisive. I am a man of religion, but religion alone cannot answer all our problems. Climate change, because it affects us all, means we have to take a more global view. We can’t neglect it. We are interdependent. Climate change is not the concern of just one or two nations. It is an issue that affects the whole of humanity and every living being on this earth. Scientists have a special responsibility, a moral responsibility, in ensuring that science serves the interests of humanity in the best possible way. I believe that to meet the challenges of our times, human beings will have to develop a greater sense of universal responsibility. Each of us must learn to work not just for oneself, one’s own family or nation, but for the benefit of all humankind. Universal responsibility is the key to human survival. It is the best foundation for world peace. The creatures that inhabit this earth – be they human beings or animals – are here to contribute, each in its own particular way, to the beauty and prosperity of the world. 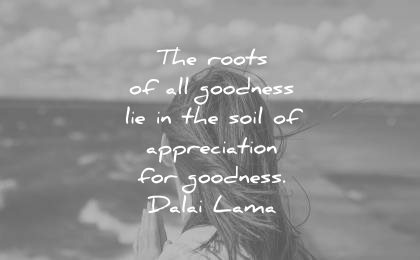 Appreciation of humanity, compassion and love are key points. If we develop a good heart, whether our field is science, agriculture or politics, since motivation is so crucial, they’ll all improve. The real way we’re going to become happy individuals, living in happy families and communities is to become more warm-hearted towards each other. 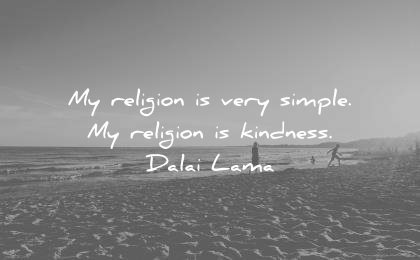 We need more loving kindness. I believe everyone has the responsibility to develop a happier world. We need, ultimately, to have a greater concern for others’ well-being. In other words, kindness or compassion, which is lacking now. We must pay more attention to our inner values. We must look inside. When the heart is closed it leads to fear, stress and anger. Nurturing the idea of the oneness of humanity has the effect of opening the heart. 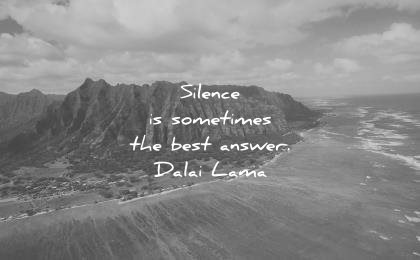 What is your favorite Dalai Lama quote? Would you like to add another one here? Please let me know in the comment section below! anger buddha compassion dalai lama deep education environment fake famous friendship funny happiness health humanity inspirational life love nature peace quotes religion short suffering wisdom.